An engineer turned nationally renown financial services executive, Cliff Cameron also is widely known for his civic activities that spanned from local groups to state government. Junior Achievement Born on Jan. 4, 1920, in Meridian, MS, Cliff graduated from Louisiana State University in 1941 with an engineering degree. He served with the U.S. Army's Chemical Warfare Service from 1941 to 1945, rising in rank from Second Lieutenant to Lieutenant Colonel. He was executive officer and commanding officer of a heavy weapons battalion in Europe, receiving A Bronze Star. Following his military service, he worked for Standard Oil of New Jersey from 1945 to 1949. An Army buddy, James Poyer, urged Cliff to come to Raleigh and start a mortgage business. In 1949, he and investors created Fidelity Bond & Mortgage Co. 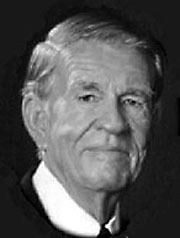 In 1955, he merged with Brown-Hamel Mortgage Co. of Greensboro to form Cameron-Brown Co.
By 1964, his mortgage business was servicing $400 million in mortgages and attracted acquisition offers. Cameron-Brown was sold to First Union Bank and Cliff Cameron became executive vice president of First Union. By 1966, he had been named chairman and CEO of the bank. By 1968, First Union reached $1 billion in assets, which grew to $7 billion by Cameron's retirement on Jan. 1, 1985. Cameron headed North Carolina Governor Jim Martin's budget and management office from 1985 through 1990, as well as serving on the Advisory Budget Commission to NC Gov. Jim Hunt. In 1974, Cliff Cameron was named Charlotte News' Man of the Year. In 1983, he was president of North Carolina Citizens for Business & Industry. Among his 100-plus civic activities, he headed boards for the University of North Carolina at Charlotte and Meredith College. He married Yvonne Smith on June 4, 1942, and they have four children.